Oh Christmas tree, oh Christmas tree! How lovely are thy branches… and they will be all the more lovely with our collection of crocheted Christmas ornaments. But why limit yourself to the tree? Deck the halls… deck your entire house in boughs of holly and crocheted decorations. Are you looking for free patterns for your Yuletide decorations? We have gathered more than 25 the best ornament patterns in one place. Check them out! All the patterns with the links are below. These beautiful ornaments are something in the middle between hanging ornaments and bulbs. Make a bunch of them in different colors, and your Christmas tree will look amazing. Candy Cane is apart from Christmas tree the most popular ornament. Of course, you can do a single one, but why not combine it with something else, like mice? Candy Cane by Yarnspirations. You may also see free pattern for a mouse. These were our best 25 free crochet patterns. Still haven’t found what you are looking for? 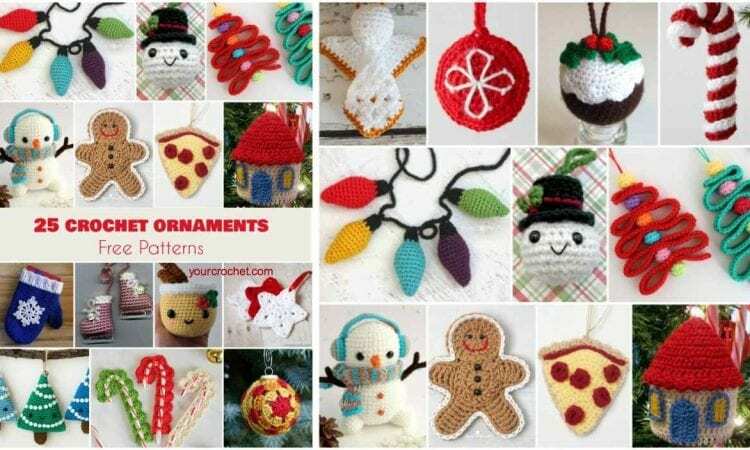 Try this ebook from Etsy- 25 Crochet Ornaments by Sewrella. There is lots of amazing stuff there! Love your stuff. They all so beautiful. Dont know where to start.